Organic Bergamot is grown almost exclusively in Italy. It is a citrus fruit similar to orange but not edible, omitting a delightful fruity and floral scent. Bergamot is a central ingredient to many perfumes and colognes and also gives Earl Grey tea its unique taste. As a traditional Italian remedy the oil was used to combat fever and infection. Organic Bergamot essential oil is considered an effective antidepressant due to its primary ingredients, Alpha Pinene and Limonene, both of which are inherently bright in smell, actively inducing hormones. Bergamot is considered a beautifying oil due to its cicatrisant properties, helping to fade scars and acne from prominence. It is also considered antiviral as it assists with ulcers and herpes. Because of it’s heavenly scent and antibacterial properties, bergamot is a popular natural deodorant. Studies have also demonstrated bergamot oil having the ability to balance the hypothalamus. USDA Organic Bergamot essential oil is wonderful to incorporate in cosmetic applications, personal care formulations, soaps, aromatherapy, and perfumery. 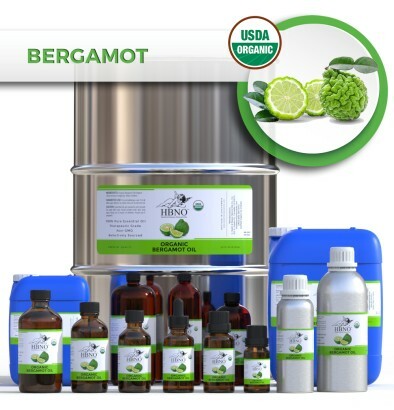 HBNO is pleased to offer USDA organic bergamot essential oil in bulk and wholesale quantities. We can supply any amount of oil to anywhere in the world. Bergamot oil has medicinal properties that offer numerous health benefits. It improves the blood circulation in the body and helps relieve stress, anxiety, and depression. It stimulates the secretion of insulin, bile juice, and digestive juice to maintain healthy blood sugar levels and digestion. Due to the presence of cicatrizant, it helps fade scars on the skin.